What are superfoods? For Jess Nadel, blogger at Cupcakes and Kale and author of the recently released cookbook Superfoods 24/7, they are whole, plant-based and nutrient-dense foods—all things that support a healthy lifestyle. Knowing about and identifying superfoods is one thing, but understanding how to incorporate them into your diet at every meal can be a challenge. In Superfoods 24/7, Jess has taken more than 35 completely accessible superfoods like turmeric, pomegranate, lentils and matcha, to create more than 100 easy, delicious and everyday recipes. I started off with Jess’s brussels sprouts latkes with tofu sour cream. This was a fantastic way to use these crunchy cultivars in a really creative and fun way. It also uses a chia “egg” as a binder, which I’ve never tried, but will definitely start using now. These were a breeze to whip up, came out of the pan super crispy around the edges, and went perfectly with the tofu sour cream, which uses umeboshi vinegar to give it that tart, sour kick. A finish with fresh dill and chives pulls everything together, giving it a clean, super fresh taste. I will definitely be making these latkes again! In addition to giving us an awesome recipe, Jess also tells us that Brussels sprouts are packed with Vitamins K, C and folate. Knowing how to prepare them correctly creates food that’s not only delicious, but super healthy and nutritious! Interested in learning ways to incorporate more superfoods into your diet? Lucky for you, the nice folks over at The Experiment publishing are not only allowing me to share Jess’s recipe for Brussels sprouts latkes (see below! 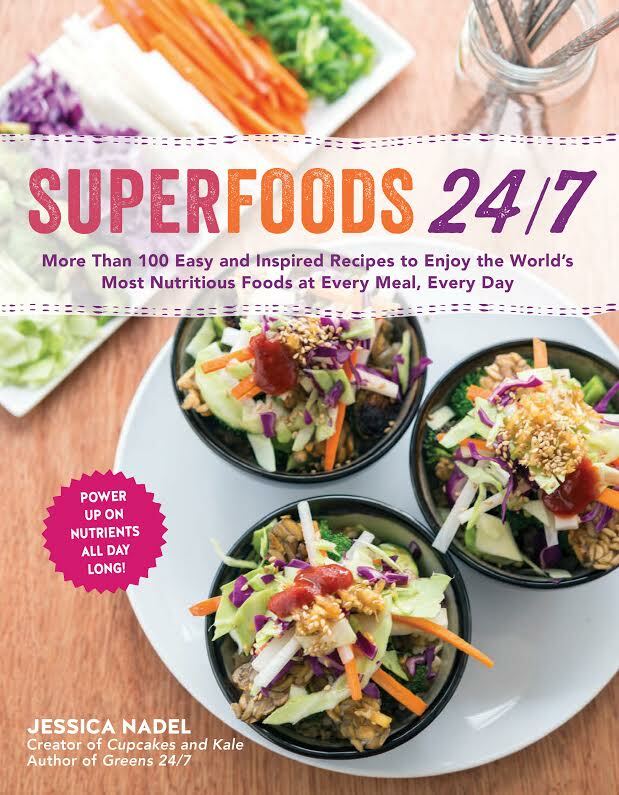 ), but are also offering a free copy of Superfoods 24/7 to one lucky reader through this post! … or do both to double your chances of winning! *please be sure to leave your email or twitter handle if you are only leaving a comment so I can contact you if your comment is drawn as the winner. Shipping is limited to US/Canada only. I’ll randomly draw and announce a winner on Tuesday, January 12. Good luck! The winner of this giveaway is Andrea, congrats! Thanks to everyone who entered! Recipe from Superfoods 24/7: More than 100 Easy and Inspired Recipes to Enjoy the World’s Most Nutritious Foods at Every Meal, Every Day © Quantum Publishing, 2015. Reprinted by permission of the publisher, The Experiment. Available wherever books are sold. Here’s one of several Brussels sprout recipes in the book that promise to make fans of skeptics. So much phytochemical goodness is hiding in these crispy little patties! For a gluten-free option, use a gluten-free flour in place of all-purpose flour. To make one chia egg, mix 1 tablespoon of whole or ground chia seed with 3 tablespoons of water and let it sit for 5 minutes. The mixture will gel and become a bit gloopy, like a raw egg. Stir again and the “egg” is ready for use. It’s best used in baked goods. In a medium bowl, mix together the Brussels sprouts, onion, and potato. Add the chia eggs and toss to combine. In a small bowl, stir together the flour, paprika, and a little sea salt and pepper. Sprinkle this over the vegetable mixture and fold in to create a thick batter. Heat a little oil in a cast-iron skillet over high heat. Scoop out 1.4 cup (60 ml) of batter and place in the oil, flattening it with the back of a spatula. Repeat with three more scoops to fill the pan. Cook for 2 to 3 minutes, until golden brown, then flip and cook for an additional 2 to 3 minutes until the underside is also golden brown. Remove to a plate lined with paper towels and then repeat with the remaining batter. If not serving immediately, keep warm in the oven at 250°F (120°C). For the tofu “sour cream”, place all the ingredients in a blender or food processor and blend until smooth. Alternatively, a hand-held immersion blender can be used. Any leftover cream can be stored for up to five days in the fridge. To serve, top the latkes with a dollop of cream and a sprinkle of chives. mine is totally chia seeds. Yum! Supposedly Nutritional Yeast is a superfood (According to a random place on the Internet). But I love love love nutritional yeast so I will take it and say that it is my favorite superfood! ? I've been loving sweet potatoes. Preferably roasted but really any way I can get them! Brussel sprouts! Roasted with balsamic and maple syrup…the best!! I'm liking everything I've been reading lately about this cookbook! The latkas look fantastic, and they use two of my favorite superfoods — brussels sprouts and chia seeds. i love anything with quinoa in it. so versatile and nutritious! I love so many superfoods it's hard to pick just one. I'd say raspberries, pumpkin seeds, quinoa and hemp seeds. 🙂 https://twitter.com/TamBlomsterberg or you can email me thorugh my website at: http://www.tammyblomsterberg.com/ THANKS! Pomegranates are my very favorite fruit. One reason I love the fall is because pons show up in the market then. I'm a fan of so many of these, especially quinoa and blueberries. Kale, kale, kale the dinosaur kind. Garlic, garlic, garlic – homegrown. Avocado, avocado, avocado bravado! I could go on and on … superfoodie here! I love brussel sprouts! I just sent my husband to the store for two pounds, and now I know what I'm going to do with them. If they're a hit, I'll have to put these in my Chanukah menu for this year. Yum! Avocado – I use it in everything! I'm in love with brussels sprouts. I really like hemp hearts! Kale is definitely one of my favorites! I love turmeric and ginger! I try to have them everyday in smoothies!